USB Driver for Android Smartphone/Tablet with Installation Guide last updated on 11-Feb-2016. USB Driver play a very important role to connect your Android device with PC. The main functions of the USB Driver is to connect android Smartphone or tablet with PC, so that the device can be accessed right from the computer system. There are several important task that we do by connecting our device to PC which includes- transfer data such as images/photos, videos, MP3, Syncing android device to PC, custom recovery installation, flashing official firmware and custom ROM’s, rooting android Smartphone or tablet and many more. You need to install proper USB Driver for your Android phone or tablet to complete all these important task. No matter whether you have high end Android devices like Samsung Galaxy S4, Sony Xperia Z, HTC One or medium range android phone, you have to install USB Driver to access your device directly from PC. USB Driver is also required to setup ADB/Fastboot properly. In this article, you’ll find all the possible ways to download and install proper USB Driver for your device. You’ll also find some Universal USB/ADB Driver Installer tools which will do easy driver installation task for you. These tools are very important for those who find difficulties to download or install USB Driver. For most branded android device, Windows operating system detects and install driver automatically when you connect the device. If not happening then you have to manually download and install the driver. 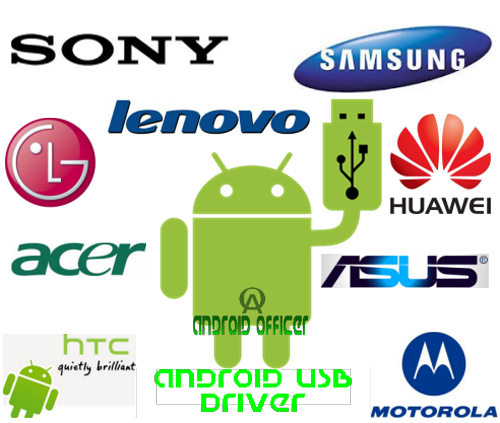 So, If you are looking for USB Driver for your Android Smartphone or tablet, find it from the below list. Below, we have listed USB driver for almost all android devices from various manufacturers such as- Samsung, LG, SONY, Motorola, Asus, Acer, HTC, Dell, Lenovo, ZTE, Micromax, Intex and many more. Make sure that, all the USB Driver listed here are for Windows users only. Android USB Driver for Linux or Mac can be downloading from the support page of the manufacturer website. Download Acer USB Driver from the manufacturer support page, follow the below steps to download. Download USB Driver from the official Micromax website, follow the steps below to download. Definitely the above list is not complete but the list contains USB Driver for most used android Smartphone and tablet manufacturers. Hope you find driver for your device in the list. Now, check out the USB Driver installation guide for Windows that will help you to troubleshoot any USB Driver installation issue. if your device manufacturer is not in the list, don’t worry, you have option to use some Universal USB/ADB Driver Installer tool that you’ll find from the below. It may happen that you downloaded the driver and run it properly but windows still unable to recognize the driver. If you are facing such issue then try installing driver by following the below guide. Turn Android device to Download Mode and connect to computer through USB cable. Open "Device Manager" (Click Start button>> Type Device Manager), Right Click on your detected device name and Click on "Update Driver Software"
Now, if everything not happening, you failed to install USB Driver, then try these tools to easily install driver software for your device. We recommend you to try manufacturer provided driver first as listed above and if not happening then try out these tools. Universal ADB Driver: This tool is unveiled by the well known android developer Kush. Support most android devices. Before use the tool, uninstall previous installed usb driver (if any) and then try this. ADB Driver Installer: Support almost all android devices from known manufacturers. Uninstall previous installed usb driver (if any) and then try this. Universal Naked Driver: This is another well known tools, but this tool is only for the Samsung, HTC, Asus, and Nexus Smartphone users. The tool is capable to install both ADB and Fastboot driver. Uninstall previous installed usb driver (if any) and then try this. I have an Insignia tablet, where can I find the usb driver for that? I did not see it on the list. So will it open all by itself, the usb driver? what is this, lenovo site got nothing ?? i have samsung SM-J500G and I installed 5.1.1 but Bluetooth device is not opening.